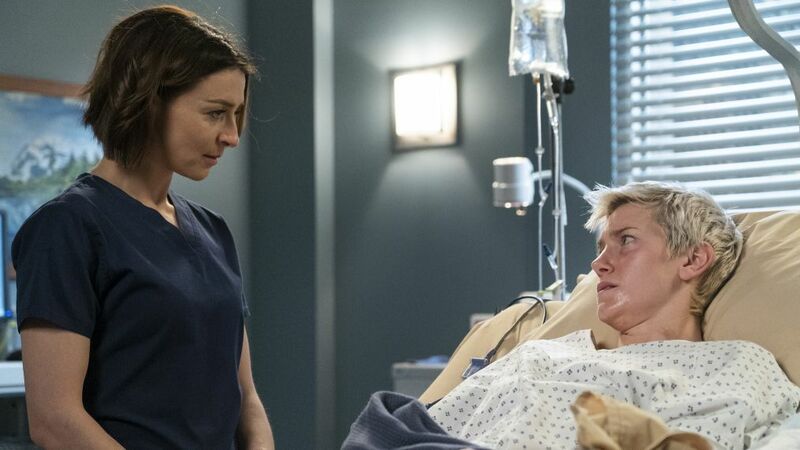 The format of many stories playing out at the same time continues on the latest episode of Grey’s Anatomy, and it’s starting to get difficult to keep track of all the moving parts of the show. It’s becoming more complicated to remember each character’s season-long story, even though each tends to play out every week. This episode seems to kick off the beginning of the end of the season, as it appears many storylines are going to be sprinting toward the finish line. This is the first time in a while that I don’t feel that there was a main plot in an episode. Instead, there are three stories that get equal screen time, along with some minor offshoots that connect to each. The most relevant plot centers on a mother and her adult child getting treated for severe injuries from a snowmobile accident. Amelia and Link are called in to work on the mother, who suffered two spinal injuries while Richard, Jackson, and Helm help their genderqueer patient. Richard has a difficult time understanding the pronouns that his patient prefers to be called and gets a lesson in proper terminology from Jackson and Helm. Richard tries to explain that he is trying to adapt to the current times, but it isn’t easy for him — even though he understands what it is like to be called something you aren’t. Jackson and Helm don’t seem to grasp what Richard says, which is the real downfall of the story. The good news is that they are able to surgically fix their patient’s problems, but the mother isn’t so lucky. Amelia and Link think that their surgery is going well when they are able to easily repair their patient’s cervical spine fractures. However, when they move on to her lumbar spinal injury, things quickly go south. The patient’s spinal cord swells and leaves her permanently paralyzed from the neck down. Even though Amelia and Link have tried to stay away from each other throughout the day and forget about their one-time “alternative pain relief” session in San Diego, the two wind up consoling each other after the surgery. They refill their pain relief prescription and give in to their budding feelings. It’s safe to say that we all knew that San Diego wasn’t a one-time thing for these two, and it will be interesting to see what the rest of the season has in store for them. The next plot has many moving parts and is made up of several smaller stories. DeLuca is still brooding a week after his father packed up and left town and doesn’t want to be bothered by anyone. His attitude is bad throughout the episode, which shows everyone — including Meredith — his immaturity. Alex takes DeLuca on his service for the day and decides to throw him a bone by allowing him to be the hero doctor for their tween patient. The child has been suffering from pancreatitis for many years and is finally eligible to have her pancreas removed to ease her pain. But it turns out that the kid is a math whiz — and smart in more ways than one. When her mom tells her that the surgery will allow her to lead a normal life again and go back to school, the patient sabotages her test results by drinking apple juice to raise her blood sugar. High blood sugar equals no surgery, and the doctors are quite perplexed as to how the number spiked. Intern Qadri finds the hidden juice box and tells Alex and DeLuca that their patient purposely rigged the test. While the patient is receiving an insulin drip to lower her glucose, Qadri asks the other interns to help beat her patient at math problems. The other interns were helping Maggie test a new project: three different rooms that each have stimulus to lower blood pressure. Maggie and Bailey, who was testing the video game room, decide to jump in on the math bowl because none of the doctors can resist a challenge. The young patient defeats all of the doctors and admits to sabotaging her test results earlier because she doesn’t want to go back to school. She hates being bullied for being smart, which is something the room full of doctors can relate to. She doesn’t want the surgery, and her mother isn’t sure whether she should push her 11-year-old into something she doesn’t want to do. DeLuca pressures the mother to force her daughter to get the surgery that she needs. Alex is stunned at DeLuca’s behavior and takes him off the case. DeLuca will not relent and talks to the patient behind Alex’s back; he winds up convincing her to have the surgery. Even though Alex is glad the kid is finally on board, he doesn’t allow DeLuca to participate in the surgery. After the procedure, Alex has a stern talk with DeLuca and tells him that he needs to check his attitude before he pushes everyone that cares about him away. He tells DeLuca that he had the same problem for years and it only brought him unhappiness. Alex gets through ti DeLuca and makes him realize that he hasn’t been treating Meredith well either. Meredith shows up at DeLuca’s house later that night to discuss what has been going on. She tells him that she doesn’t have time to be dating someone who is distant and can’t get their act together, which prompts DeLuca to fully realize the extent of his actions. He promises that he has gotten over the number his father did on him and goes back to being his old self. The new couple makes up, but this isn’t going to be the last time that his problems will come up. Meredith has opened her eyes and witnessed that her much younger boyfriend isn’t on the same level as her. I’m not quite sure how long their fling will last, but I wouldn’t be surprised if they break up by the end of the season. The final story of the episode depicts the ongoing drama between Teddy, Owen, and Koracick. Owen has cleared his schedule to attend birthing class with Teddy and isn’t happy when Koracick also shows up. Teddy doesn’t make it to the class and winds up on bed rest all day due to some minor contractions. She has Carina page Owen, who quickly comes to her aid without telling Koracick what is going on. Owen hangs out with Teddy all day and makes several pitiful attempts to talk to the unborn baby, at Carina’s suggestion. Watching Owen try to talk to the baby is as painful for the audience as it is for Teddy and will make you wonder how Leo is such a happy baby around him. Teddy is increasingly stressed that the baby will come early, but the bed rest helps. Things get more stressful when Koracick finds them in the same hospital room and learns what has been going on. He asks Owen to step outside and talk, which neither guy really wants to do. Koracick is beyond mad that Owen didn’t tell him that Teddy was having problems and asks if he would have even been paged if the baby was coming. Owen has been rude to Koracick ever since he started dating Teddy, and Koracick finally slams Owen for his behavior. Koracick gives a good speech about how Owen has had his many chances with Teddy and always lets her down and shouldn’t be mad that she now has someone in her life who is completely committed to her and loves her. Hopefully this is the wake-up call that Owen needs because Koracick plans to stick around, and the two are going to have to learn to at least be civil.